Last night at 9:30 I returned to our home in Bayit Vegan from the joint funeral of Gilad Sha’ar, Naftali Frenkel and Eyal Yifrach HY”D in Modiin. The truth is, though, I never really made it to the funeral. My brother, 3 friends, and I drove together on highway 443 towards Modiin at 5:00 PM. At a certain point we saw signs for the Modiin cemetery and then we noticed many cars strewn along the sides of the road as well as the median strip and we too found a place to park. As time passed we joined with more and more brothers and sisters of Am Yisrael. We calculated that we walked close to 4 miles until we stopped walking. When we could walk no more, because security was blocking off the road for the high-profile attendees, we could hear faint echoes of the loud speakers carrying the eulogies, but no coherent words. We stood there for 15 to 20 minutes, one of our crew davened mincha with a bunch of men assembled on the side of the road and then we proceeded to walk back, the same 4 miles, with throngs of people, to our car. I write this tonight, not only to share that experience, but also to share of a momentous occasion which my family marked this morning. 13 hours after returning home from the outskirts of Modiin, I returned home from the Nefesh BeNefesh offices with the Teudot Zehut (Israeli citizenship ID cards) of Ariel, Yocheved, Daliah and myself (Yocheved and Daliah don’t get their cards until they’re 18, I believe, but they did receive numbers). Today, we became Israeli citizens. One may ask, so what?! I have been here for 11 years now and feel entirely at home. Ariel has been here for 6 years and has developed a comfort with the language as well as an expertise with the joys and challenges of the land and its people (and its bureaucracy). Yocheved is blossoming as a bilingual 2-year-old who already prefers being without shoes outdoors–a sure sign of being a local. And 6 month old Daliah is eating humus as one of her first foods. All of those questions are the questions that our people have been asking for 2,000 years. Especially now, while our wounds are painfully open, we wonder where are going? How much longer? Are there any leaders who can help us get to where we need to be in a real way? The most incredible part of the experience though, was that nobody was actually concerned with the answers. The thousands of yidden who marched in Modiin last night didn’t need to get anywhere or see anything or hear any speeches. We went simply to shvitz together. Yesterday. And for all of Jewish history. And this too is the feeling in my heart today. Making aliyah with my wife and 2 precious daughters is our declaration that we’re here to shvitz with Am Yisrael. It’s a hot and sometimes seemingly endless road. At times it’s unthinkably painful. Questions of faith as well as those of national security have no clear answers and we’re often forced to accept the unacceptable. But we are here to join this precise reality and would never want to be anywhere else. There is much to complain about and we are by no means innocent of doing so, but at the end of the day we’re not going anywhere else. We have seen in the past weeks some of the most moving expressions of brotherhood and empathy from Jews worldwide. No Jewish heart was disconnected from this traumatic episode and all truly celebrated the unity which has been reached as a result. The Gemara in Taanis, 11a, teaches that Moshe opted to do something very odd while Am Yisrael was fighting against Amalek. His essential job in the battle was to be the conduit for Heavenly support while the soldiers were fighting. While doing so, however, he stood with his hands raised in the air. And as time passed, they grew heavier and heavier and he became more and more uncomfortable. And the Gemara wonders, he couldn’t find a chair? There was no pillow to rest on? The Gemara answers, Moshe could not participate in the war in comfort while his brothers and sisters participated with pain and suffering. Every member of Am Yisrael has his or her place in our national journey. (In my humble opinion) it is not yet the time for every Jew to clear out of the exile and come home. There is much work yet to be done for our people and by our people all over the globe. But now more than ever we all must do our part not only to daven and feel with Am Yisrael but also to shvitz with Am Yisrael. To be active participants in the process and shvitz, every man, woman, and child in his unique way, with Am Yisrael. Today we have come home to try, to the best of our ability, to tie our personal destiny with the destiny of Am Yisrael. We are forever grateful to Hashem for allowing us into His home and bringing us to this point. Equally, we are eternally indebted to our beloved parents without whom we could never have made it this far or anywhere for that matter. May we all merit to see the shvitz as well as the blood and tears be wiped away for good and may the next march of Am Yisrael be with music and joy up to the rebuilt Yerushalayim. May your aliyah bring an aliyah in all aspects of your life. This is a beautiful article. You expressed very well what I feel. As I celebrate 19 (B”H!) years in Israel , I tell people “this is where it’s at”. 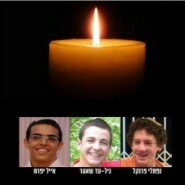 As I grieve for those boys and their families, I’m also preparing the paperwork for my family’s Aliyah. Thank you for a timely, beautiful message. As Aaron & Hur held the hands of Moshe up in the battle – may we too do the same, as we set our hand to the work ahead – even in the heat of battle. Thank you, Yoni Miller – for your words. As I sit here in the misrad hapnim with another 70 numbers ahead of me in line, I read your article and couldn’t help but smile as I, to, shvitz here with am Israel and the Israeli bureaucracy…..
A sweet, touching and moving tribute to the reasons we all stay here….. And a refreshing view on all the intense sadness that we’ve been through. And I agree, I’d also add “kvetch” to the “shvitz”. Thank you for your article. The minimum of believing in Moshiach is to think every day that Moshiach could come today. The Lubavitcher Rebbe, a great tzaddik said that the world is ready for Moshiach and he is coming very soon.